Sometimes I amaze myself when it comes to looking at how many movies I missed from the last decade. I didn’t really start (over)indulging in film until just three or four years ago, and I never bothered with a lot of the major blockbusters. That’s how I skipped out on Casino Royale (or Bond films period), and a lot of the big-budget action flicks from recent years. Because of this large gap in my movie-watching history, I made sure to include The Bourne Identity in this year’s project. Looking back ten years later, it’s weird to see Matt Damon look so young. Regardless, he is more than capable as the ex-CIA operative, Jason Bourne, who is rescued from the Mediterranean Sea with no recollection of his past. His only hint comes from an account number to a Swedish safe deposit box that is surgically implanted in his hip. He quickly learns that he has better reflexes and hand-to-hand combat skills than the average person, and a trip to the Swedish bank reveals even more curiosities: the deposit is box full of passports with different aliases, several types of currency, and a handgun. The CIA is alerted to Bourne’s bank visit and soon he finds himself on the run with no clue as to why. Bourne hitches a ride with Marie Kreutz (Franka Potente), an unassuming pedestrian who accepts a $20,000 offer to get him to Paris. Soon she becomes targeted by association, and the two embark on a wild adventure as Bourne attempts to learn who he is, as well as who is trying to kill him. As far as spy thrillers go, this is a good one. There are moments of groan-inducing cliches, but for the most part this is a well-crafted adventure that rarely lets its foot off the pedal. A car chase scene through the streets of Paris is exhilirating, as are the moments when Bourne encounters hitmen who are out to eradicate him. There is never a shortage of adrenaline-pumping action and suspense, and the film even manages to include some romance (though not a major focal point, thankfully). The movie has a good set of villains in place, with Bourne’s former boss Alexander Conklin (Chris Cooper) leading the operation to get rid of the ex-operative once and for all. The hitmen sent after Bourne are intimidating, especially “The Professor” (Clive Owen) with his extraordinary sniping skills. 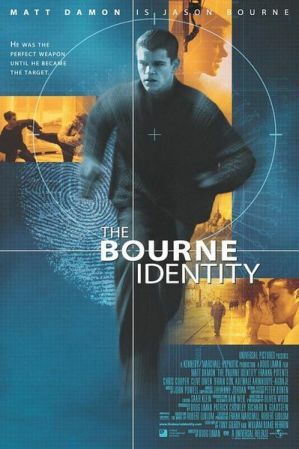 The Bourne Identity is a fun thriller with a little more brains behind it when compared to others in the genre. It feels a little dated now, but it’s still an entertaining watch with plenty of thrills. I am looking forward to seeing the rest of the trilogy in anticipation for this year’s entry in the series. There are a lot of major movies I still have not seen, so I think it happens to all of us. This is a very good one that I did see. I vividly remember the beginning because Matt Damon speaks a bit of Dutch and it shocked me, wasn’t expecting that. It sounded pretty good. Haha, that’s great that Damon nailed that little bit of Dutch. He was really in the zone for this movie — can’t wait to see the rest of the trilogy. This trilogy just got better and better. Apart from a couple of great moments (the mini chase included) this left me a lttle underewhelmed. The third one was outstanding and the new one with Jeremy Renner also looks awesome! I am going to go against what Pete said, I enjoyed this one the most I think. I can’t really remember… Maybe I am just trying to be awkward. Hmm.. if the sequels are just on par with this one, I’ll definitely be happy. I just saw this one last year for the first time, and I also thought it stood up well with current action thrillers. Clive Owen’s character was very interesting, but I was a bit upset they didn’t flesh him out more (or at least let him live longer :p). Matt Damon does a good job acting here as well: he portrays the amnesia stricken Jason Bourne very well, and I give him praise for that too. Overall it’s a great action movie and I hope you watch the others soon too! Glad to hear I’m not the only one late to this movie. 😀 I kind of wish some of the hitmen were fleshed out a little more, too, especially The Professor. They were still worthy adversaries, though, and helped create some suspenseful moments. Thank you for the kind words! It’s great to hear that you enjoyed this movie despite your initial reservations. It’s a fun one indeed, even for non-action fans. Not sure I see the dated angle…I know I liked it when it came out. And the sequels too 🙂 Cheers! Maybe ‘dated’ was the wrong term, because this still holds up with a lot of modern action films. It will be fun to see how the sequels compare several years later. Thanks for commenting! Still my favourite Bourne film. Right on, man. Looking forward to seeing how the others compare. Hey, better late than never, Eric. Glad you got around to finally seeing this. I LOVE the Bourne trilogy and this franchise makes me think Matt Damon is cool 😀 I like everything about it, the action, the dialog, car chases, even the understated romance between Bourne and Marie. I like Franka from ‘Run Lola Run.’ Can’t wait to hear your thoughts on the rest of the series, it’s one of those rare franchise where all 3 movies are solid and entertaining. So are you excited for the new movie, Ruth? It seems like Jeremy Renner could be a good substitute for Matt Damon. I remember I avoided this film when it was first released. I couldn’t think of someone more inappropriate to play an action star! Words eaten after watching Supremacy. Identity is a fantastic thriller/spy film. I think the car chase here is one of my all time favourites and probably made people remember how amazing a well choreographed car chase can be. With no, or at least very well hidden, CG! The Bourne trilogy is one of my all time favourite spy films. Love them all. Not sure how I feel about the upcoming sequel with Renner. The trailer makes it look like your bog standard action film, which the first 3 Bourne films were definitely not. We’ll see! Glad you enjoyed this one 😀 So when are you going to watch Supremacy? Yeah, that car chase was pretty awesome. Definitely one of the highlights of the film. 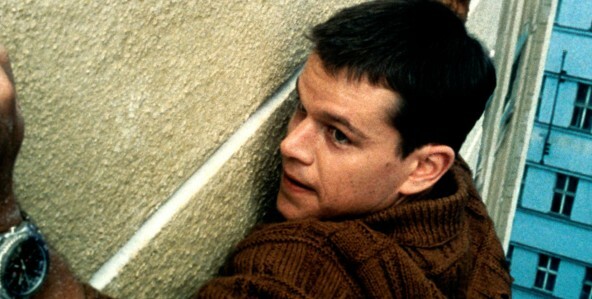 I also loved the tense scene where Bourne comes back to his apartment for the first time. It’s so quiet, and you just know something is going to happen, but the suspense builds up for a really long time. I should check out Supremacy while the first one is still fresh in my mind, but I have no idea when I will get to it. I have a big stack of movies already sitting at home. 😀 But I won’t wait too long. It’s been a long time since I’ve seen the Bourne movies. You’re definitely lucky you missed this in theaters. I saw all three and came out with massive headaches…the queasy cam was popularized with this movie. Ahh, that’s a major bummer. I didn’t notice any of that in this movie, thankfully. The Bourne Identity was pretty good but my favorite is the third one. This really put Matt Damon firmly on the A-list though as he proved he was a major box office draw and ended up having his own franchise. Cool, so it seems like the series gets even better from here. Sounds good to me! Damn, Damon looks so young in those pics. I liked all three of those films but the 3rd is probably my fav. Not sure how you mangage to avoid seeing these for so long. I agree with your review and with your rating. The whole trilogy is pretty damn good, especially considering that it is rare for franchises to remain at a good level over time. I laughed at your surprise about how young Matt Damon looks. He has certainly aged lately, plus I don’t think the longer hair he’s had lately helps him. The 2nd part of the Bourne trilogy is the lesser film, the 3rd is pretty much as good as the first for me. Haha, well I guess I am so used to seeing Matt Damon in recent films that it startled me to see him in his younger days. I love that many of these comments have been saying this series is consistently good throughout, definitely a rare feat (as you stated). Makes me want to see the sequels even more. Thanks, Niels! Glad you were able to finally see this excellent spy film. I love the third Bourne film and enjoyed the second slightly less, but I’d forgotten how strong this one was until I watched it again on DVD a few years ago. It’s a bit less chaotic than the sequels but tells a really good story. Clive Owen does a really good job with little dialogue, and Chris Cooper is a good villain.